Do you ever find yourself getting overwhelmed when it comes to meal prep? If so, you aren’t alone. So many of us struggle to plan out our week’s meals in advance. Not only do you have to choose something delicious to make, but you also need to prepare your list for grocery shopping. If you don’t enjoy the process, you’re less likely to do it. And then what happens is you wind up eating the same thing week after week or you go for takeout. When planning your meals is no longer a hassle, you can enjoy cooking and eating food that’s good for you. 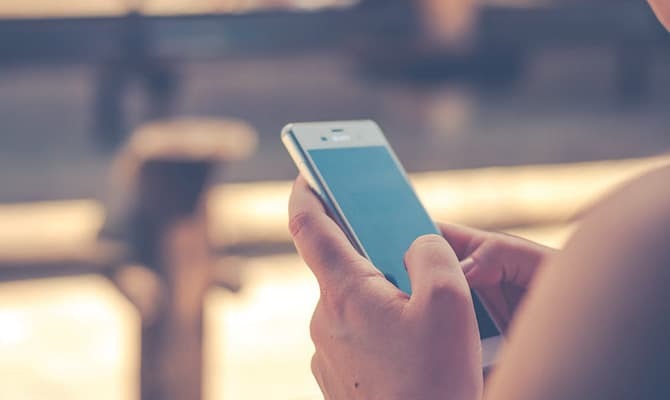 Luckily, there are plenty of apps you can download to make it all much simpler. We’re sharing 14 meal prep apps to make cooking easier so you can look forward to getting into the kitchen. For the busy bees of the world, Mealime was created with you in mind. They’ve targeted their app to busy singles, couples, and families. It provides them with a way to plan their meals, while also making healthier decisions when it comes to what they eat. It helps take the guesswork out of what dinners you’ll be putting on the table every night, which is just what many of us need especially after a long day at work. 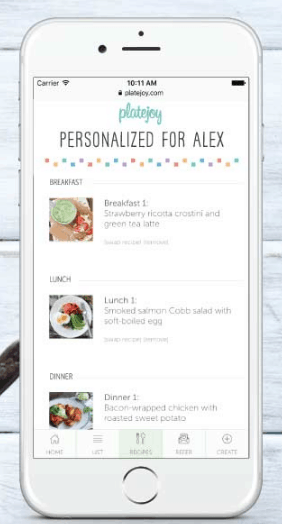 With over 200 personalization options, you’re able to plan your meals for the entire week. That means there’s no last-minute questions about what you should eat for dinner. You shouldn’t have any unhappy family members on your hands either because you can customize your meals based on allergies and dislikes to ensure every dish is something you’ll love. With Mealime, you’ll be able to select a meal plan that suits your needs. This allows you to add your eating preferences, diet type, dislikes, allergies, and any restricted food. The app will show you meals that fit within your plan. It even displays substitutions for certain ingredients in case you need to make a swap to fit your unique tastes. From there, you’ll receive an organized grocery list with all the items you’ll need to make that week’s meals. This comes in handy because you won’t need to make any quick trips to the grocery store because you forgot to buy something. Then, it’s up to you to whip up a delicious meal in your own kitchen. How would you like the ability to take any recipe and transform it into an organized grocery list? If you’re tired of scribbling down ingredients on a piece of paper, you’ll want to look into an app like Cozi. With Cozi, you won’t ever have to worry about leaving your shopping list at home because everything is saved right onto your phone. It goes wherever you go! 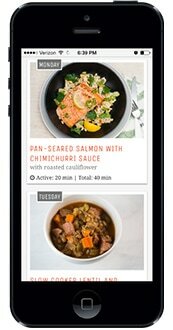 The app works by allowing you to drag and drop recipes onto days of the week. It’s designed to help you avoid last-minute dinner decisions. If you’re planning for a family, your spouse and children can have access to the meal plan as well. Once you’ve chosen your recipes, everything is populated into a simple grocery list that allows you to check off items as you get them. Not only that, but you can efficiently use Cozi while you’re cooking thanks to its Cooking Mode. This feature keeps your screen lit, so you never have to use your messy hands to turn it back on again. It works for any computer, but can also be used on the iPhone, iPad, Android phones, and Android tablets. This means everyone can have easy access any way they prefer! 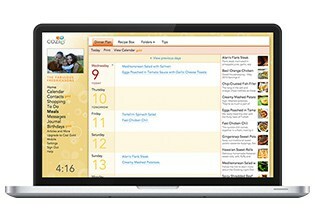 With a wide array of meal plans to suit your dietary preferences and needs, eMeals is a great option for meal planning. You’ll begin by creating an account, which allows you to choose your desired meal plan. This can be changed at any time as you need change. When it comes to meal plans, you’ll see a variety of options, including: 30-Minute Meals, Budget Friendly, Classic Meals, Clean Eating, Diabetic, Gluten-Free, Heart Healthy, and even Kid-Friendly. There are also meal plans done in collaboration with names like Better Homes and Gardens and Dr. Axe. No matter what your preferences are, there’s a meal plan for you with eMeals. Once you’ve chosen your plan, you’ll see a list of applicable recipes. You’re then able to choose from those meals to create your dinner plan for the week. After a recipe is added, the required ingredients will be added to your grocery shopping list. Hitting the grocery store with an organized list in your hand will help you get in and out in no time at all. Read our full review of eMeals here. Are you in need of some help in the kitchen? If so, let Pepperplate come to your rescue. Their aim is to help users create personalized menus, plan meals, and create efficient grocery shopping lists. Not only that, but you can easily share your favorite recipes with friends and family via email, Facebook, and Twitter. Another great feature of Pepperplate is that they allow you to create a full recipe library. Instead of flipping through cookbooks or keeping random recipes written on bits of paper, everything can be digital. You can create your own recipes or import them from a website to save for later. They can then be accessed via your iPhone or Android device, the Windows apps, or apps for the Nook or Kindle. This means that no matter where you go, your favorite recipes are with you. You can also use your phone to follow along with the recipe. Thanks to Cook Mode, the screen never dims while you’re in the middle of cooking something. How would you like a place to store recipes, an easy way to plan meals, and a simple way to create grocery lists and keep track of what’s already in your pantry? What if you could take it with you because it easily syncs across devices like your iPhone and iPad? That’s exactly what MealBoard was designed to do. With MealBoard as your go-to meal prep tool, you’ll be able to easily store the recipes that appeal to you. You can use their built-in web browser to search recipes from around the web an add them to your account. From there, you can begin planning your meals in the simplest way possible. You’re able to move meals to a designated day, add meal notes, adjust the number of servings, and set meal prep reminders. 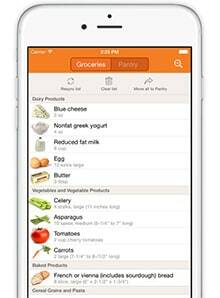 It only takes one tap to generate your grocery list. It’ll be sorted by aisle so you can be truly efficient with your grocery shopping. If you plan to head to multiple stores, you can view your lists by store so you never miss a thing. MealBoard even provides a way to keep track of various items that are already in your kitchen so you always know what you already have in stock. 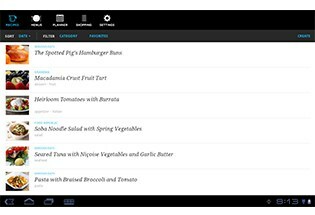 With availability for your computer, iPhone, and iPad, you can access MealBoard in whichever way works best for you. 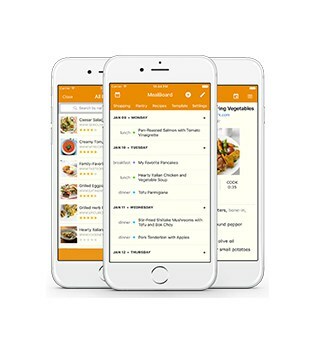 If you’re looking for the most customized meal plan available, based on your lifestyle, taste preferences, and health goals, PlateJoy is the app you want to be using. This app not only works for those who are looking for personalized meal plans, you can also use it as a way to help you lose weight. The interface of the app is super easy to use. You start by logging on, answering a few questions to help them understand what you’ll like and they’ll begin to customize your meal plan right in the app immediately after. It’s our favorite for a reason—it works like magic! Each meal I tried was fit specifically to my taste and health goals. That meant no need to waste time checking nutritional guidelines and counting calories. One of the most incredible aspects of PlateJoy is that once you find a recipe you like, you can send all of the items to Instacart, where they will bag up, buy, and deliver your groceries for you. Read our full PlateJoy review here. 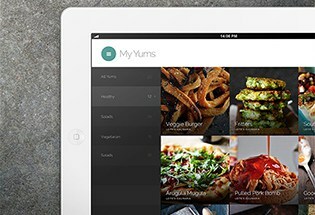 With an app like Yummly, you never have to struggle to find the perfect recipe for your next dinner. Instead of sifting through boring recipes all over the web, you can use their search filters to find exactly what you’re looking for. In fact, you can search for recipes based on holiday, type of cuisine, taste, diet, nutrition, allergy, cook time, techniques, and more. If you need to make something in a pinch, but you don’t have a stocked kitchen, you can even sort recipes with their “with” and “without” filters. It couldn’t be easier to find the kind of recipe you want with Yummly. Not only can you search for great recipes, but Yummly also suggests ones they think you’ll love based on your preferences. Once you find your favorite recipes, you’re able to save them and share them with the click of a button. Everything can even be organized into collections such as desserts, pasta recipes, chicken dishes, etc. This feature is essentially like Pinterest, but exclusively for food. Yummly also helps you create a handy shopping list that you can take on the go, thanks to their apps for iPhone, iPad, and Android. BigOven touts itself as being the best recipe organizer, grocery list, and menu app for home cooks. 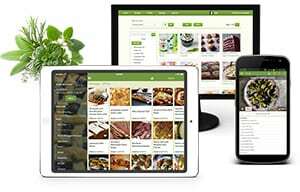 With apps for iPhone, iPad, Android, Kindle Fire, and Windows Phone, you can have easy access to all your favorite recipes while on the go. You’ll receive instant access to over 350,000 recipes, your grocery list, and your meal plan no matter where you are. You can see what other people are making in their kitchens, search for just the right recipe for your next meal, save the recipes that look most appetizing, and create shared grocery lists. Another great feature allows you to use the leftover ingredients in your fridge by typing in up to three ingredients and conducting a search. Unlike many meal planning apps, BigOven is actually its own social network as well. You can follow friends and family who are also using the app to see what they share. You can leave each other comments and questions to interact. A meal prep app that has over 30 million home cooks signed up has to be a great one, right? 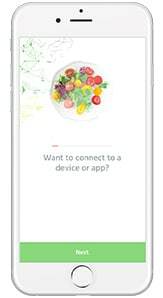 The Allrecipes Dinner Spinner app is not only a handy way to decide what’s for dinner, but it’s also a social community that’s brining cooks together. It’s all about helping people share their love of cooking. You’ll receive a personalized feed that’s customized based on the recipes you save and make, so it takes your tastes into consideration. There are robust search options that allow you to search by keyword, ingredients to include/exclude, cooking time, and dietary needs. You can even find recipes based on what’s on sale at select grocery stores so you can save extra cash. 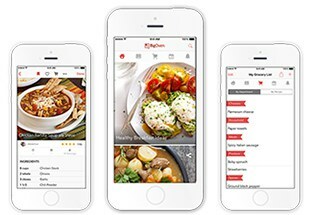 With over 50,000 recipes inside their app, you’ll surely find something you like. From there, you can add ingredients to your shopping list. When cooking, you’ll find many recipes have step-by-step videos that you can follow along with. It’s perfect for those who are beginners and still gaining experience in the kitchen. Once you’ve whipped up something great, share it with friends on Allrecipes or to your Facebook feed. 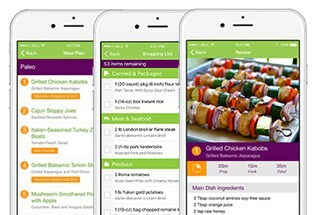 With weekly meal plans, cooking guides, and even cooking lessons, CookSmarts is one powerhouse app for meal prep. 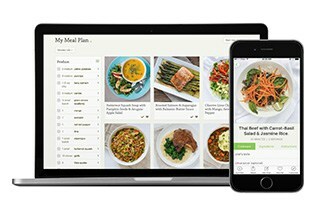 They’ve designed their app to deliver you a tasty meal plan every week. It includes four dinners that provide you with gluten-free, paleo, and vegetarian options to suit your unique needs. Their plans help eliminates the need to ask what’s for dinner because everything is already sorted out for you. It’s also designed to reduce food waste by using the foods you buy, while also cutting back on impulsive buying. When you know what you’re making for dinner, you can shop with those meals in mind and get only what you truly need. Once you’ve customized your recommended meal plan to your tastes and needs, you can cook with ease thanks to their detailed recipes. There are technique videos you can watch, prep-ahead sections, and organized steps for you to follow. 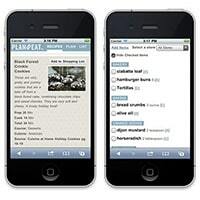 With the Plan to Eat app, you can collect recipes from anywhere and save them into your personal Recipe Book. Once you’ve saved some recipes you’d like to try, you can move them into your planner. This allows you to think ahead when it comes to what you’ll eat for breakfast, lunch, and dinner. With a simple drag and drop feature, planning has never been quicker! When your week’s meals have all been planned out, you’ll then have access to your shopping list. It can be viewed on your phone or printed out to take it with you when you head to the grocery store. Are you looking for a way to create personalized meal plans based on your food preferences, budget, and schedule? If so, the Eat This Much app is here to save the day. It’s designed to help you stick to your diet and reach your nutritional goals with ease. You’ll ave access to their calorie calculator and meal plans so you can stay on track. You’re able to customize your eating preferences, whether you’re vegan, paleo, or something else. Eat This Much also allows you to add the items already in your pantry. With this feature, their algorithm will suggest recipes based on what you already have to help reduce food waste. Once you’ve chosen your desired recipes, an automatic grocery list is created. You can start shopping yourself or send it to a service like Instacart to have food delivered. Nutrino plans your meals based on your health and fitness goals. It also takes into account your taste preferences, dietary needs, and your biochemistry. 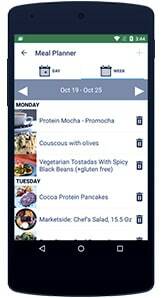 It’s truly a personalized meal planning app that will help you achieve your goals when it comes to your health. Nutrition doesn’t have to be stressful when Nutrino chooses all the best foods for you. It’s designed to ensure you’re getting the proper nutrition and fuel to get you through each and every day. The app also allows you to log food, exercise, water, sleep, and stress levels. This helps Nutrino learn about you and your habits, to help further customize your meal planning. With Spoonacular, you’ll have a place to store all your favorite recipes, plan your meals, and create your grocery lists. You can search over 330,000 recipes or even upload your own to save them for reference. Then, you’re able to add those recipes to your weekly meal schedule. There’s plenty to choose from, no matter what kind of diet you may be following. A grocery list is then generated so you can head to the store and pick up everything you need. Spoonacular also has other great features such as: providing nutritional information for every recipe, price estimates for each recipe, and even the Recipe of the Day to help you get inspired with your own cooking. 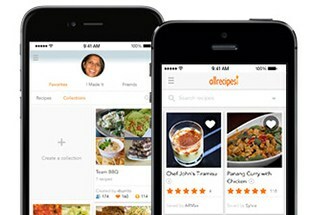 Through the help of ChefTap, you can clip recipes from any website you’re browsing and save them right inside the app. Whether you find the recipe on your favorite blog or on Pinterest, saving them is so quick and easy. You’re then able to take your favorite recipes with you wherever you go. Plus, you can even organize all your saved recipes into collections. This makes it easy to find whatever you’re looking for at any moment. 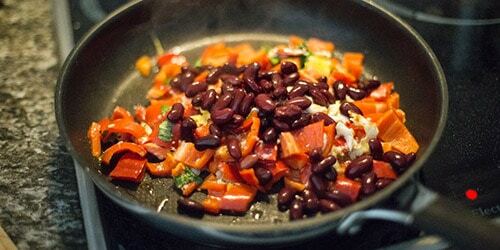 Once you’re ready to cook a meal, you can follow along with the recipe in the ChefTap app. Everything is displayed an an easy-to-read format for phones and tablets. Are there any meal prep apps specifically for keto or paleo? Not that I currently know of. However, with PlateJoy you can customize your meal plan and let it know that you only want to follow a keto (high fat and protein) diet. That might be the best option for people following the keto diet.